Our family orders a 1/4 of beef every year from a co-worker of mine. This gives us the motivation to clean out our freezer and to find those things that are buried by seasonal items that are crammed in every nook and cranny throughout the year. Instead of throwing out anything, I decided to break out my industrial size stock pots and make beef stew. About a month and 1/2 ago, I purchased the reusable Tattler Lids. Tonight was the first night that I was able to use them. To be quite honest, I was a little hesitant to use them as they are a little different than what I have used and trusted. They are thicker so the rim doesn't twist down as much. 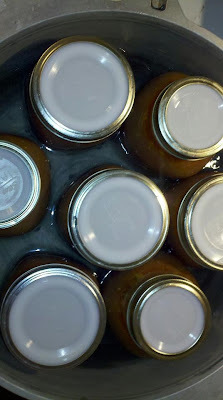 I also found that I spent a lot of time making sure that the rings for the lids sat evenly on the rim of the jar. I was so nervous that I would have them slightly off and the jar wouldn't seal correctly. Then I discovered that 1. once the lid was on the ring sat correctly and 2. on the wide mouth jars, if I put the ring on the lid then placed it on the jar, the process was much easier. My soup is currently in the pressure canner so I do not have an update on how they sealed but I promise to give an update tomorrow. Some positives are that the process to can and prepare the lids is the same as the metal lids. Minimal learning curve. The Tattle lids are thick and sturdy, I can see how they will last. I am really looking forward to getting over my hesitation and having the trust in my standard metal lids to transition over to my new prized Tattlers. Please do let us know how well these tattlers work! I am dying to know! My dear darling hubby bought me a small supply of Tattler lids to try. I've been using them for dry, vacuum sealed things for a few months, and then a few weeks ago, I decided to try canning some chicken stock with them. Success!! I'm feeling quite earthy, and will probably be getting more. They are a little pricey to start with, but in the long run will be cheaper. I've never canned stew, and am excited to see how your batch turns out!